The kitchen island. Ah yes, my island getaway. I can spend hours napping there in both sun and shade. Stretched out completely or curled up with my head buried in my very famous paws. But something changed recently. 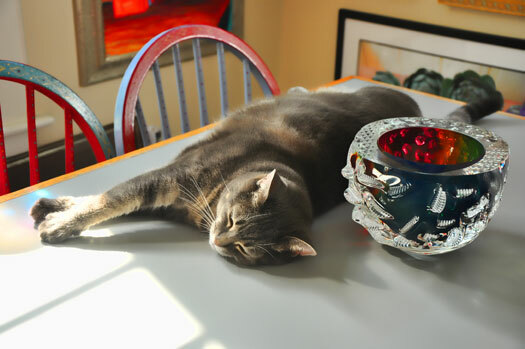 My favorite place for the curling up part of the day was in a large ceramic bowl in the middle of my island, often overflowing with a couple of day’s mail, but still managing to accommodate my rather large though incredibly cuddly furry form. Alas, the ceramic bowl has disappeared, and in its place a glass bowl now rests. And while beautiful and certainly playful with the sunlight that streams through the south-facing windows, it is decidedly smaller in circumference. So small, in fact, that neither the mail nor yours truly will fit within its confines. Rumor has it (a rumor certainly not started by me) that Gabby peed in the larger bowl as a reaction to repeated unwanted advances from Rennie. I think she just doesn’t like junk mail. Anyway, a small bowl that not even she can fit into now rests in the space once occupied by my bowl of choice. Judging by the above photograph, snapped by a passing member of the paparazzi, I don’t seem to mind all that much. My island getaway is still a great place to…er…get away. you do look comfy sweet pea… i wouldn’t worry my head about where that old bowl went to…..